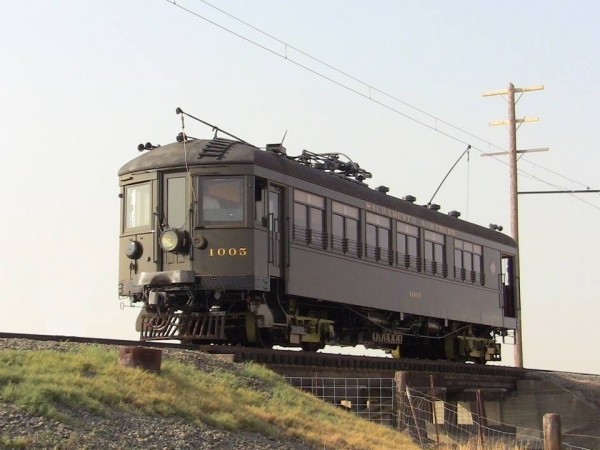 Sacramento Northern 1005 is a double-end, double-truck, arch-roof, wooden interurban car with a steel underframe. It is a combination car with a main compartment, smoking compartment, baggage room, and toilet. The ends of the car have steel sheeting over the wood siding. Car 1005 was built by the Holman Car Company of San Francisco in 1912 for the Oakland, Antioch and Eastern Railroad. It is part of a four car series, 1003 to 1006. 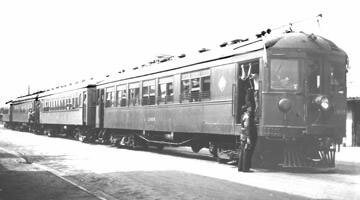 The car was equipped with trolley poles for operation on the OA and E and a pantograph for operation on the Key System. It ran on both 1200 volts and 600-volt systems. The voltage on the Sacramento Northern was later raised to 1500 volts. Third rail shoes were added to the car after the merger of the Sacramento Northern Railroad and the San Francisco - Sacramento Railroad so it could run north of Sacramento. The car went through the typical electric railroad reorganizations, but only operated on two different systems. On the SN system it ran as Oakland, Antioch, and Eastern 1005 until 1920, then San Francisco – Sacramento Railroad 1005 until 1928, and finally the Sacramento Northern 1005 until 1941. In 1936 Sacramento Northern entered into an agreement with the California Toll Bridge Authority to deed a portion of their equipment to the Authority in return for funds to adapt their equipment for coded cab signals, speed control for operation across the Bay Bridge. 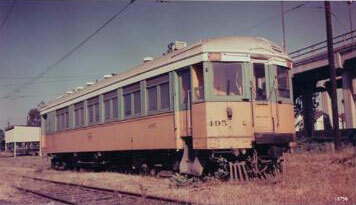 The 1005 was one of these cars deeded to and passed on to the Authority on abandonment of service in 1941. With the beginning of World War Two, the Key System was in need of additional equipment and purchased several of the retired SN cars, including 1005. The SN third rail shoes were replaced with Key System third rail shoes for service on the Bay Bridge at the Key System’s 600 volt third rail voltage. The 1005 ran on the Key System’s F line as Key System 495 until June 1949, when the Key took it out of service. The Bay Area Electric Railroad Association purchased the car from the Key System in May 1951 and restored it to its SN appearance for fan trip service. There were many of modifications made to the car by the Key System, and then when retired the car was stripped for parts by the Key System making returning it to service a large project. The car was damaged in switching accidents in April 1953 and again in June 1962. After spending time at Western Pacific’s Jeffries Shops where the railroad determined that the damage was to extensive to repair, 1005 was delivered to the Western Railway Museum in February 1964. The most recent restoration effort has reversed most of the modifications done to the car since 1934, repaired damage done in both switching accidents, and reversed deterioration done by years of out of door storage. The Sacramento Northern did not have a car house and the car spent its entire life outdoors. Owners: Sacramento Northern 1005. Oakland, Antioch & Eastern 1005. San Francisco-Sacramento 1005. Key System 495. Technical Data: Wooden combine. Built by Holman Car Company in 1912. Seats, 50 passengers. Total car weight, 98,540 pounds. Trucks: Baldwin 79-30 B. Wheels, 37-inch diameter steel. Axle. Journals, 5 X 9, 2 plain bearing, 6 roller bearing. Traction motors, 4-140 horsepower @ 750 VDC, 115 horsepower @ 600 VDC, inside hung. Air Brake Equipment: Westinghouse Traction Brake, AMM. Automatic brake valve, M-24A. Triple valve, M2B. Double check valve, #15. Brake cylinder, 14 X 12. Governor, type N. Dynamotor/Air Compressor 2- YE3 / D2L. Dimensions: Width, 9’ 10”. Length, 58’ 0”. Height, 13’ 1”. Truck centers, 38’ 1”. Truck wheelbase, 79”. Propulsion Equipment: Westinghouse Electric and Manufacturing type HL. Master controller, 15A2. Switch group, 265E. Reverser, 284E2. Traction motors, WE&MCo. 322E. Gearing, bull 55 teeth, pinion 22 teeth, ratio 2.5 to 1, 5” face. Control switch, Westinghouse 494 with pneumatic trip. Power resistors, 8” 3 point. MU plugs, 12 point. Misc Data: Couplers, Janney radial, 1904 MCB contour. Pantograph, Westinghouse Electric S-522-A, should be US-122. Trolley shoe, TS&W steel shoe with back up wheel. Trolley Base, US-14. Whistle, two Westinghouse Air Brake trombone. Horn, two Westinghouse Air Brake pneumonic. Bell, two air. 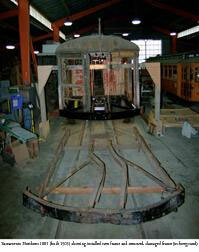 Current Condition: Under restoration in the Museum’s shop returning the car to its 1934 configuration. Proposed Future Treatment: When the restoration is completed the car will be maintained in its 1934 configuration. Photo 2 Caption: Sacramento Northern 1005 (built 1905) showing installed new frame and removed, damaged frame (in foregound).